Top military officials pushed back this week against the idea that the Army is suffering from a postwar identity crisis, instead mapping out what the Army of the future will look like. 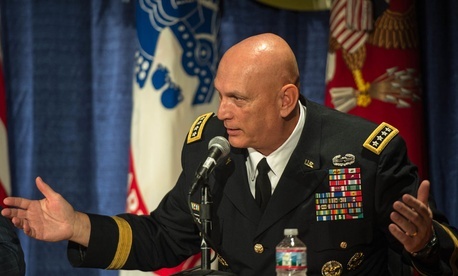 "For those who think we don't need an Army, look around the world and see the things we do every single day," said Gen. Raymond Odierno, the Army chief of staff, at a conference Tuesday held by the Association of the United States Army, the service's advocacy group. 1. The Army will increasingly focus on working with other branches of the U.S. military and its allies. That means focusing less on large-scale ground troop missions that have defined the traditional image of the Army during the recent Iraq and Afghanistan wars. For example, future operations would deploy a smaller number of troops and likely look more like the Pentagon's Ebola mission—where more than 3,000 soldiers will be deployed to Africa—or the ongoing advisory role with the Iraqi military to battle ISIS. "Our allies not only look to us to lead, they expect us to lead," Odierno said, adding that the service is "setting the foundation now for the future operating concept." 2. The Army's strategy will require soldiers to be ready to tackle a diverse range of future problems. Officials summarized the new plan as "winning in a complex world," which requires soldiers to be able to quickly adjust to a new mission or respond to a rapidly developing crisis. "You may have to go to Africa. You may have to go to the Baltics. You may have to go to Korea.… But I do know that I want you to go there, and I want to exceed all expectations," said Gen. David Perkins, the commanding general for the the Army Training and Doctrine Command. 3. The Army will have to make do with less because of congressional budget caps under sequestration. The Army is expected to scale down to 450,000 soldiers, and potentially even 420,000, if the sequester goes back into effect in fiscal 2016. That could mean a roughly 100,000 cut from the size of the Army earlier this year, but Army Secretary John McHugh said Monday at the conference that another round of sequestration "will gut our force." Pentagon officials have made no secret about the fact they think the budget cuts make it harder for the military to quickly respond to a national security threat. Under President Obama's five-year budget, the Pentagon projects that it will need more than $535 billion in fiscal 2016. But under the budget caps, the Pentagon is expected to receive less than $500 billion, leaving a $35 billion budget hole. 4. That means the Army will have to change how it trains its soldiers and buys its equipment. In some ways the transformation has already started. Odierno said that training models are incorporating threats that are "reflective of the complexity that our nation faces"—including guerrilla and insurgent warfare. The U.S.-led fight against the Islamic State of Iraq and Syria has brought insurgency groups back under the military's spotlight. Officials are boosting their cyber abilities and increasing opportunities to train with the National Guard, he said, so that the service is "slowly regaining our readiness." But the new plan isn't just a change in people, but a change in process—namely how the Army spends its money. With the tight budget environment, the Army—and the Pentagon as a whole—is being pushed to become more efficient with how it buys its equipment. Perkins said that it's more than just thinking of different ways to innovate, "it's about increasing the speed of innovation." But the Army's push for a quicker response time could be limited fiscally and physically. "As we continue to lose end strength, our flexibility deteriorates," Odierno said. "... We are witnessing firsthand mistaken assumptions about the number, duration, and location of future force conflicts." 5. Don't expect the Army to give up its ground-troop focus. Just because the Army is working more with others and focusing on smaller missions, leaders were quick to emphasize that it's been ground troops—a staple of the Army—that have won previous conflicts. "No Tomahawk missile ever conducted a ground counteroffensive," McHugh said. "We have to regain a robust, reliable, and ready force, not some hollowed-out shadow of a former self.… Airplanes and ships alone cannot win our wars or protect the peace."